Like many districts serving low-income populations, it was fairly easy for Piedmont City School District officials in Alabama to find funds for devices. District officials wanted to leverage technology to open up opportunities for the 1,240 students in this rural community, so they started sending devices home with kids in grades 4-12 in 2009 through a program they call mPower Piedmont. However, lack of access to the Internet after school and in kids' homes became a major obstacle to learning with those devices. At first, teachers tried to work around Internet limitations, letting students download what they’d need for work at home before they left school. Teachers also helped students find places in the community that had free Internet, like restaurants. Downloading content worked for some things, but it didn't allow students to truly take advantage of digital tools, like interacting with peers, accessing flipped instruction or conducting online research, said Matt Akin, Piedmont’s superintendent, in an edWeb webinar. At first, to compensate for disparities in Internet connections, many local businesses cooperated with the district and allowed students to use the Internet at their establishments. However, it was difficult for students without independent transportation to get themselves around town. Late one night, when Akin was leaving the middle school, he saw students sitting on the steps of the school trying to use its Internet. That's when he knew they needed to devise another solution. Akin applied for a Learning on the Go grant, part of the E-rate program that helps subsidize the cost of Internet for schools and libraries. The district used the money to contract with a vendor that partnered with the city to build a wireless network on existing fiber optic cables that weren’t being used. Then, the school district used E-rate funds to lease use of the network. But, as so often happens with pilot programs, E-rate didn’t renew the program the following year, so the district had to shoulder the costs of maintaining the network. “The advantage is, wherever they open their computers, they’re connecting back to a network that we lease that connects not only to the Internet, but back to our network at school,” Akin said. Students can now access online homework and flipped lessons, collaborate virtually and connect with their teachers. It costs the district about $10,000 per month to lease the network and pay for mobile hot spots given to students who live outside the range of the city network. That’s 3 percent of the district’s budget. It sounds expensive, but Akin says it was the single-biggest factor in transitioning the district toward new ways of teaching and learning. But teachers worked hard to move away from traditional tools like PowerPoint and annotated PDFs and toward more creative uses of the new tools at their disposal. “We invested a lot in teachers,” Akin said. “We found that it doesn’t matter if the environment is digital, it’s all about the teachers. The best professional development we do is to try and find times for our teachers to collaborate and work together.” Teachers have common planning times and seven flexible paid professional development days during the summer built into their contract. The district’s total commitment to this experiment is paying off. Not only are teachers using a variety of tools to change how they approach instruction, but online learning has also expanded the course offerings. As a small rural district, Piedmont used to offer only Spanish as a foreign language. Now it can offer five languages, including Chinese. Access to the Internet has also pushed the district toward a competency-based model, where students can move at their own pace through course work, sometimes taking two courses in a year, allowing them to pick up an elective or take AP courses for college credit. Blending online courses with what can be offered in person has also given students who have fallen behind a real chance at catching up and graduating. “What traditionally happens is a kid gets behind and they can only take a certain number of credits in a year, so they never really have the opportunity to catch up,” Akin said. The scheduling just doesn’t work out. Akin is excited that Piedmont High School is now offering eight AP courses, up from two, and has far more interesting electives like guitar, robotics and computer science (which counts for math credit) than it ever had before. The district has also incentivized summer learning to fight the learning loss many students experience during summer months. Kids can keep and use their school-issued devices through the summer if they agree to take at least one online course. Now 40 percent of middle-schoolers are taking credits toward high school during the summer. “Our goal is to keep students engaged, but obviously the more credits they can earn in the summer the more opportunity they have to earn advanced credit before they graduate,” Akin said. 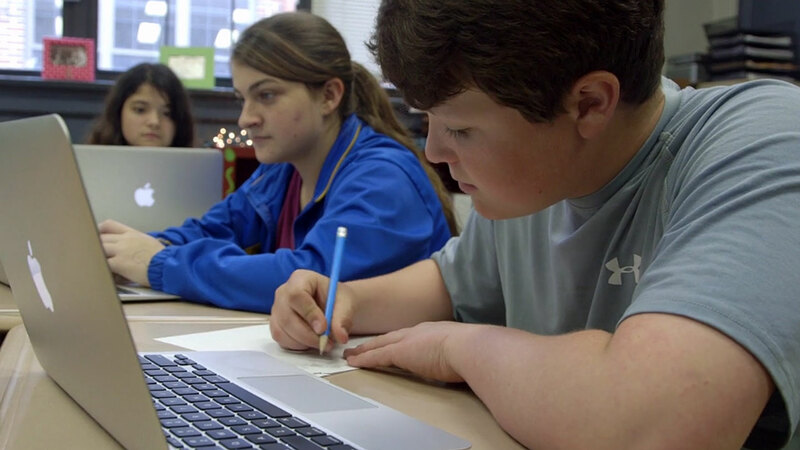 Piedmont’s middle school has always had high test scores, but the new digital focus has opened up opportunities to make the entire school competency-based. Students have small group instruction time and then continue that work through online programs that re-emphasize what was taught. The schedule is flexible, so if students are ahead in science but behind in English, their schedules can temporarily be rearranged so they have more time to focus on challenging areas. “When you allow middle-school students to set their own pace they don’t always choose a fast pace,” Akin said. “So it’s personalized to a certain extent, but we also spend time helping them set goals.” Students meet in teams of 20, in which teachers help them set academic, personal and team goals. The effort to re-energize the district through technology seems to be working. For the past two years, 100 percent of Piedmont seniors were accepted to college. The district is working now to track those kids and see how they fared when they got there. Test scores have also gone up, although Akin said that was never the focus of mPower Piedmont. Akin hopes that if he and his colleagues can transform the school district, more opportunities will open up in Piedmont, an otherwise struggling town. He’s not naive about the fact that many kids go off to college and never come back, but he’s hopeful that in an information economy where most work happens online, there will be good jobs that keep his graduates in the community, too.